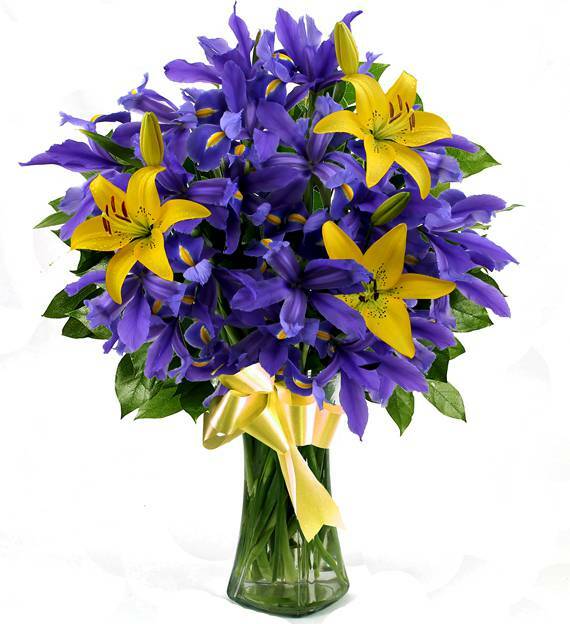 A lovely blend of regal purple iris flowers and sunny yellow lilies make a beautiful and striking arrangement. These fresh blooms are appropriate for a variety of occasions, whether it be a holiday, birthday, anniversary, or get well wishes. Sure to leave a lasting impression. Deluxe Flower Arrangement depicted in photo above. 03/19/2014 10:47AM Beautiful arrangement.— Kelly N.
09/29/2011 11:46AM This is such a fun mixed arrangement, it really made my birthday bright. The flowers are so fresh and fragrant, it's really a quality arrangement.— Reagan B.